So last week was Women in Sport Week; an initiative whose aim is to transform how women and girls are perceived in sport, what role they play in leading and working in sport, and to get women’s sport noticed. Poppy Allen: My posture has gotten so much better since starting derby, both mentally and physically (if that’s a thing). I feel more confident within my body, and can walk without slouching. I thank endorphins and the fantastic community that comes with the sport. Yan Zacks: The best thing for me is the experience of getting to benefit from the knowledge and skill the ladies in the league have, between most of you there is over 4 years of group knowledge, excitement and enthusiasm. Gem Aargh Turner: The best thing about roller derby is that it is a predominantly female sport. Women are doing something (in drones) that they normally wouldn’t. It allows them to feel comfortable, to be themselves and to compete. Women in this sport are the trailblazers and when men wanted to get involved they were welcomed in as equals. That’s pretty refreshing. My experience playing football as a teenager was a stark contrast. So the best thing about being a woman who plays sport, is that I get to share my experiences with my awesome teammates. The Women in Sport initiative not only campaigns for women to have equal status in all aspects of sport it also aims to increase partnerships like Comic Relief and the Youth Sport Trust to encourage participation in women and girls of all ages to reap the benefit of sport throughout all their lives. Women in Sport supports campaigns like This Girl Can to help women overcome fear of judgement and make healthier life choices; a sentiment our very own wonder woman, Kat, echoes. Katherine Rebecca: In our society we reside in an environment controlled by the aesthetic, negotiated through the ‘gaze’ of others, and of ourselves. Roller derby has the capacity to arrest this surveillance by fostering an environment where the focus shifts from fashion to function and from ‘pretty’ to performance. 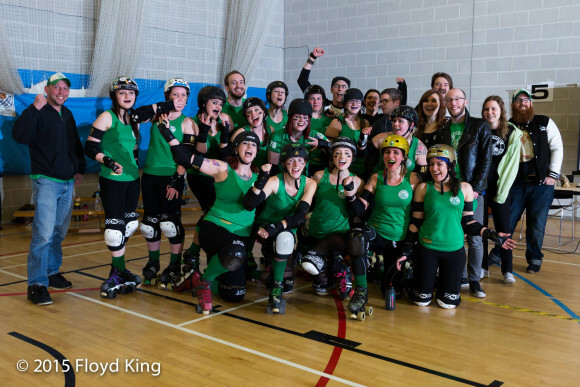 In derby, women celebrate their bodies for what they can achieve, not what they look like: For every body type has its place and each brings its own set of skills on the track to complement this diverse sporting activity. Nikki Barnsley-Walker: As an adult, I’ve never been involved in a sport until I joined Nottingham Roller Derby and started training. Initially I had preconceptions about how I may be treat or perceived and I’m so glad to say these were smashed out of the water. I’ve never felt judged or intimidated, rather welcomed by everyone, male and female, challenged and supported. Being female, I feel, comes with a certain expectation of how I should look, and I thought being involved in a sport would highlight this; but I’ve found being involved with roller derby, I care less about how I look (because no one else does) and instead strive to be fit and healthy. It’s important to continually challenge misconceptions, stereotypes and negative attitudes towards women in sport; to fight against the perpetual barrage of mainstream images of body types and what it means to be a woman in sport and to promote equality in all aspects of the sport industry from the boardroom down to the track. This entry was posted in Experiences by nottsogentle. Bookmark the permalink.